In a warehouse in New Jersey, some messy, weird stuff went down. 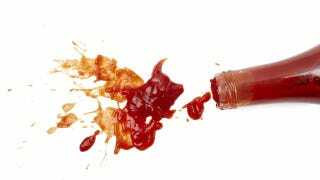 There was an explosion, but not just any explosion: a counterfeit ketchup explosion. No, nobody was trying to sabotage the illicit shipment, there's some science behind it. Admittedly there are some other questions here? Why counterfeit ketchup? The plan was to put cheap, standard Heinz into bottle for the more expensive "Simply Heinz" and sell it at a profit. Why mess with bottle switching instead of counterfeiting labels? Who knows. Why are they exploding, on the other hand, is a little simpler to explain. By transferring the condiment from one bottle to another, the hapless counterfeiters opened the ketchup up to contamination by all kinds of microbes. But how is that any different from standard bottling? Well in a legitimate bottling operation, you kill those microbes with heat first. And as for why unrefrigerated bottles of ketchup don't explode on restaurant tables, they're being opened frequently, and hopefully used up and replaced.